The past month or so I have been avidly working on designing more French Boutis patterns. Today I published one just in time for Valentine’s Day on my Etsy site. This French needlework technique is easy to do if you like handwork. Stitching the piece is rather like hand quilting, a small running stitch, on two pieces of batiste. Then the boutis yarn is drawn through the channels by inserting a tapestry needle from the back between the two layers of fabric. Voila! In my kit I provide the pattern, instructions with photos and finishing technique, the white and pink batiste needed to complete two hearts, a white sun catcher and a pink sachet. Also included are the two needles necessary for stitching and toothpicks needed for stuffing in the tail ends of the yarn cording. Other materials you provide are white and pink thread, a ribbon or cord for finishing, and filling for your sachet. I am working on about six other designs as well. If you love handwork and would love to try this ancient French Needlework Art, give it a try. There is also a digital pattern available. It’s a small piece, easy to work up quickly…just in time for Valentine’s Day! I also teach French Boutis to anyone interested. Thank you to my dear French friends, Nicole, who introduced me to this beautiful art nearly 15 years ago with a gift for my newly born granddaughter, to Maggy and Nicole, who have supplied me with lots of books and magazines for inspiration, to Elisabeth, who sent me a piece of her own hand worked Boutis, and last but not least to Elizabeth from Canada at Seams French who shares this passion with me! Stay tuned for more finishing work next time! Happy New Year to all! I hope all of you had a great Christmas and a super start to the New Year. Ours was a lot of fun spent with family and friends. We sure missed our Colorado family though. They did not make it here this year. My finishing business was slow over the holiday so I managed to get some stitching and finishing done for myself. Then I worked on a list of unfinished projects I hope to do this year. I will save the list to show for my next post. Here are a couple of finishes I did before Christmas. P.B. did a beautiful circular pumpkin design and asked me to do a pincushion. This was a special Christmas gift for someone. Tinsmith’s Wife sent a stitched snow globe. She finds the loveliest patterns! Personally, I managed to finish my project from the Waterfall Glen EGA group. It is a Catherine Theron “Winter Strawberries” needleroll. The area that says “Scissors” and “Needles” is done over one on 32 count linen with variegated silk floss. The small pincushion in the center is also done over one. The edges and center lines between the strawberries are done in Palestrina knots. The inside is lined with Dupioni Silk. The pattern called for linen needle pages and a scissor fob, but I chose not to do that. No fob and wool for the needle pages. It is about 8 inches long when opened and about 2.5 x 3.5 when closed. It was a project that I was not fond of after I began it, but it did turn out to be a quite nice small needleroll. 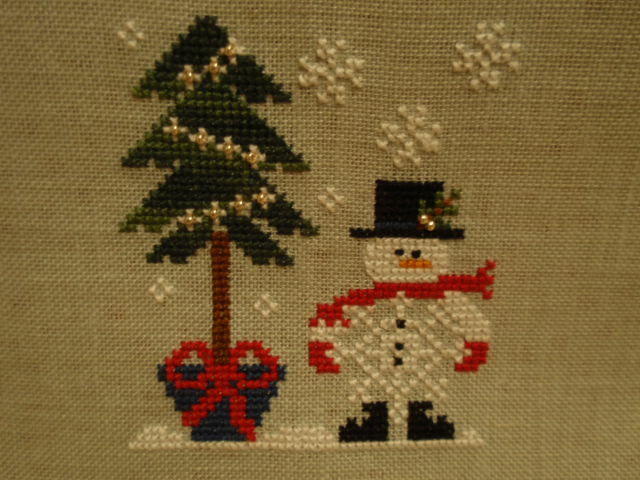 Then I saw Plum Street Sampler’s pattern for “Merry One” and “Merry Two” and bought them up as soon as I could. They just caught my eye and I delighted in stitching Merry One right away. 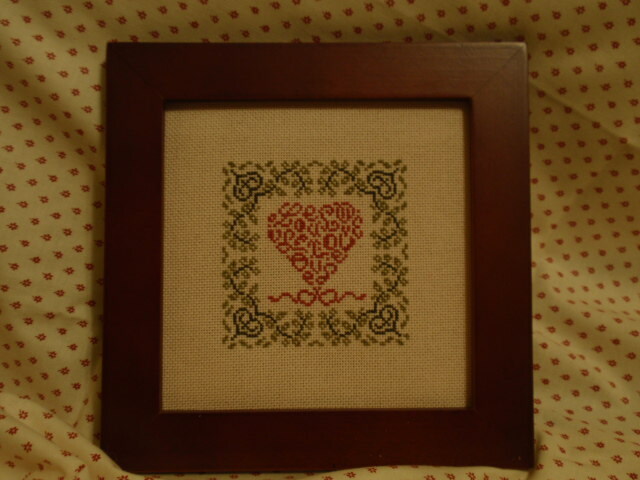 It is stitched over one on cream 25 ct. Irish Linen (which I sprayed with my antique spray). It turned out about 4 x 6. The pattern came with white chenille trim, but I used some green that I had and I love the way it turned out! Merry Two is completed, but not “finished” yet. Here is my finish for Merry One. HAPPY VALENTINE’S DAY a little early. With Valentine’s Day coming I did a couple of special stitched pieces. I wanted a big red heart to remind me of the lovely big red heart candy valentine boxes that my dear husband gave me when we were dating. 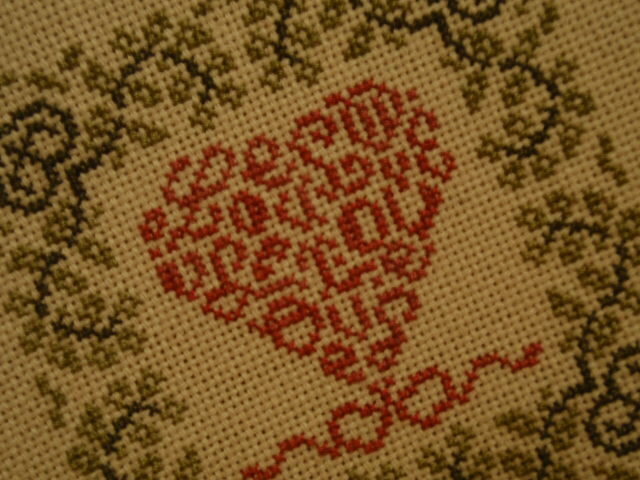 I found this pattern and I “finished” it into a lacey big red heart in memory of that special time. I did it on 40 ct. Aztec Red over two. It turned out to be about 5 x 7. I also found this cute pattern for a “Valentine stocking” and created it with a real red velvet backing. It was done on 36 ct. Lambswool over two sprayed with antique spray. Then I stuffed it with “Merci” chocolate candies. YUM YUM. It turned out to be about 2 x 7. It was such fun having time and energy to do some of my own stitching. It makes me want to resolve to do more this year! In just a few days it will be Valentine’s Day. I’ve always wanted to do a small stitching and I found one last year when I was in Colorado…of course, I only worked on it this week. It was done on an Irish Linen 26 count over one thread with DMC and Weeks Dye Works Begonia. The delicate lacy look attracted me to this JBW pattern called French Country Love. And then I completed stitching a couple of more ornaments I was working on….”He’s a Flake”…the third in the LHN series for this year. The ornaments are completed, but not “finished.” I guess I’d better get to that this weekend. And without an additional photo, I did complete another “Peace and Joy” Santa ornament from the Drawn Thread. (You can see the first one on my side bar.) I gave this first one away to my very special sister-in-law for Christmas. I loved it so much I had to make another. It has been busy at the office. I gave notice to work only two days per week rather than five days per week as of the end of March. I hope this will relieve a lot of stress I have been under this past year. In addition, after the health problems my DH and I had recently, I think it is time to spend a LOT more time together rather than at the office. Life is just too short…I want to live it to the fullest!